A promotional image featuring the paws and claws heroes of Beasts of Burden. Art by Jill Thompson. One of the things that’s really distinguished Dark Horse from their competitors is their strong focus on horror comics; between books like the ever-expanding Hellboy franchise, Buffy The Vampire Slayer comic spin-offs and Eric Powell’s The Goon, it feels like the first time since EC that a major publisher has made the genre such a crucial part of their regular output. 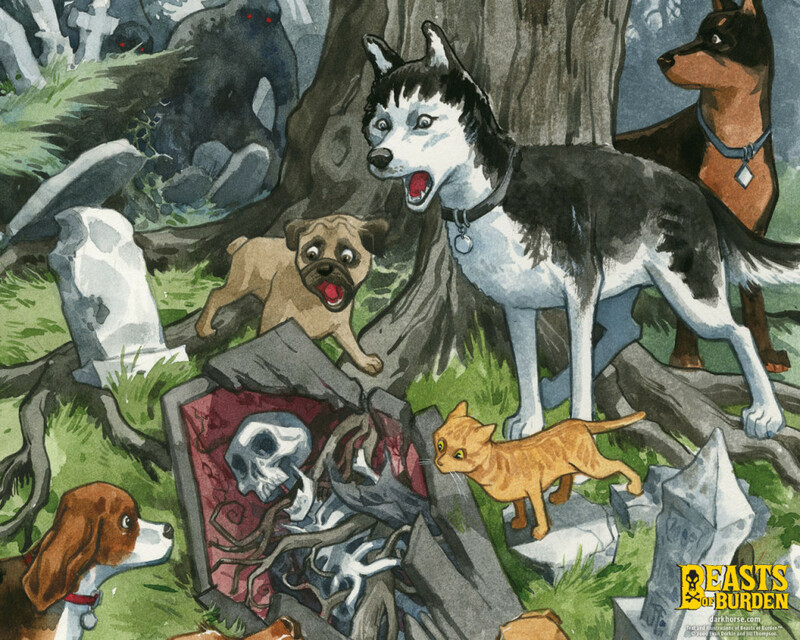 With that in mind, it’s worth pointing out that Evan Dorkin and Jill Thompson’s long running Beasts of Burden has quietly established itself over the last decade as not only one of Dark Horse’s best titles but an outstanding horror series in its own right. Beasts follows a group of neighborhood dogs (and a cat), including curmudgeonly Pugsley, perpetual loner The Orphan, psychic terrier Whitey and werewolf bite-enhanced husky Ace, as they attempt to fight the supernatural forces that plague their suburban home of Burden Hill. Although Evan Dorkin made his name as the creator of wildly sardonic, funny comics like Slave Labor’s Milk & Cheese and Dork!, his collaboration with Thompson on Beasts of Burden has a mix of icy chills and (for lack of better term) genuine humanity that’s a huge tonal departure from his previous works. One of the positive side effects of Beasts of Burden’s irregular production schedule is that it allows Jill Thompson to provide the art on every story, which is important as her watercolors are essential to the reading experience. Given the emphasis on seemingly ordinary backyards and lovingly rendered, slightly exaggerated animal expressions, her style here is reminiscent of a Norman Rockwell Saturday Evening Post cover. If Norman Rockwell, you know, also drew severed human arms attached to leashes and sewers filled with skeletons. Thompson’s painted pages create a veneer of normalcy that threatens to shatter at any given moment, revealing the unthinkably scary things waiting in the shadows as Dorkin’s script dictates. Mike Mignola’s Hellboy teams up with Burden Hill’s protectors in “Sacrifice”. Art by Jill Thompson. 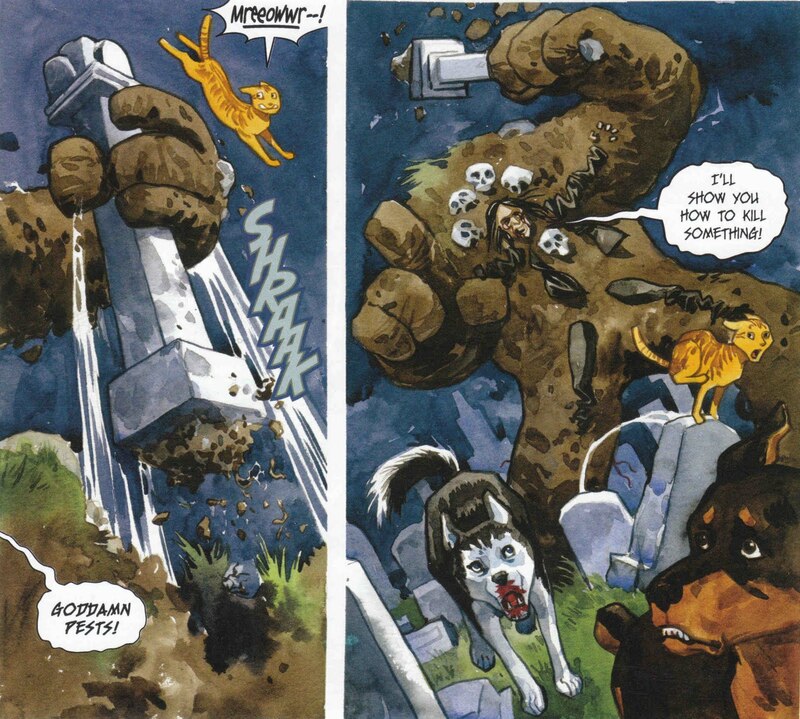 The very first Beasts of Burden story, 2001’s “Stray”, first appeared in The Dark Horse Book of Hauntings. Clocking in at eight pages, the conceit is as ingenious as it is simple; the gang investigates a haunted doghouse. What’s really impressive about “Stray” is that while it wasn’t initially intended to be the first of a series, it does a great job establishing the feel that future Beasts of Burden stories follow (and gives us a glimpse of a larger cultural history of animals and their place as guardians in the supernatural world). Based on the success of “Stray”, a handful of other short stories followed each year in other Dark Horse horror anthologies until in 2009, the series received its own four issue mini-series. While each Beasts of Burden installment is mostly self-contained (with stories that find our heroes up against threats like a coven of suburban witches and their black cat familiars, a boy werewolf, a sinister frog demon or flesh-hungry zombie dogs), they each subtly advance a larger story: the titular beasts are being trained by a mysterious council of “Wise Dogs” that has apparently existed for centuries and the seemingly random threats they face are hinted to be related to a larger occult enemy just out of sight. 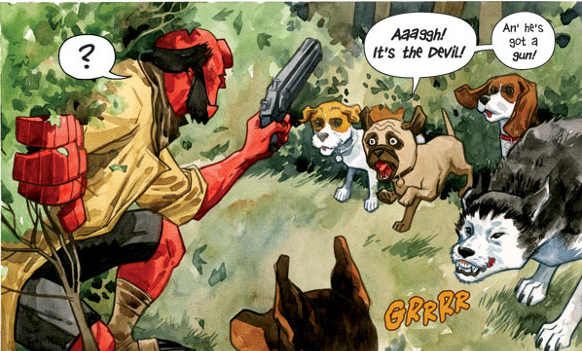 The BPRD’s own Hellboy even appears in a special crossover one-shot co-written by Mike Mignola that is very much in continuity with the ongoing tale Beasts is telling. The beasts face off against an undead punk rock warlock-turned-golem in “Grave Happenings”. Art by Jill Thompson. What makes Beasts of Burden so compelling is its impressive formula of scares and heart. Although it helps that the protagonists are the kind of cats and dogs we all know and love, Dorkin’s furry heroes are brave (if reluctant) warriors and loyal friends. One of the main sources of conflict in the series is the natural tension between The Orphan, a stray cat, and his canine companions. He’s frequently the object of scorn from the loudmouthed Pugsley and there’s even something resembling a class clash in his envy/resentment for his friends’ domesticated lifestyles. But when he is nearly killed disrupting a ritual in “The Unfamiliar”, cowardly Rottweiler Rex leaps to his aid and almost loses his life in the process. 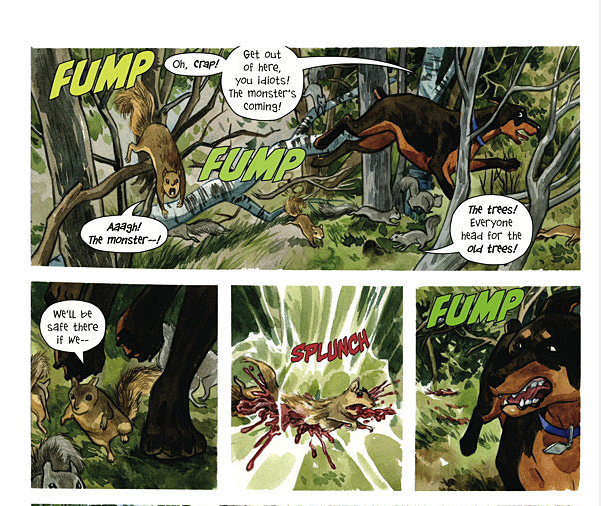 At the same time, Beasts of Burden doesn’t pull a single punch; despite being a “talking animal” comic, it’s truly scary and often incredibly sad. “Let Sleeping Dogs Lie” greets the reader with a gruesome close up of a fly-covered dog corpse laying by a road while “Lost” follows the beasts as they attempt to find a grieving mother’s missing puppies (their final fate isn’t pretty). If anything, the book’s choice of an almost all animal cast enhances the horror and melancholy of the stories; as a reader, we’re instinctively disarmed and totally unprepared for what comes at us. As the beasts’ battle against the supernatural wages on, it takes a clear toll. In “Grave Happenings”, the stoic Rex asks the others “Remember when all we used to do was sleep and eat?”. Dorkin even tweaks the Old Yeller school of sad dog stories in “A Dog and His Boy” as we helplessly watch the tragedy of Ace’s friendship with a homeless “talking” teenager unfold. To me at least, Beasts of Burden feels like the grown up offspring of James and Barbara Howe’s Bunnicula novels. But while those were fun young reader’s books that merely flirted with the supernatural, Beasts is a slowly unwinding horror saga with very sharp fangs and some heavy shoulders. With this Wednesday’s release of the latest chapter, “Hunters and Gatherers,” we take one more step in what has proven to be a long, dark walk through Dorkin and Thompson’s woods. Several panels from the upcoming Beasts of Burden one-shot, “Hunters and Gatherers”. Art by Jill Thompson. Beasts of Burden has been partially collected in a hardcover collection, Animal Rites, and all stories to date can be purchased digitally on the Dark Horse Comics app. The first three short stories, “Stray”, “The Unfamiliar” and “Let Sleeping Dogs Lie” can be read for free on Dark Horse’s website. “Hunters and Gatherers” is available in stores and online on March 12th.